Alexandria, VA—It’s easy to celebrate cherry blossom season in Washington, D.C. with boat cruises and water taxi service from Old Town Alexandria. Take in 1,700 cherry blossom trees coloring Washington&apos;s Tidal Basin and the activities of the National Cherry Blossom Festival happening March 17 to April 15, 2018. Then cruise back to Old Town to enjoy cherry blossom-inspired food and drink offerings and seasonal hotel packages. Walkable Old Town is the perfect home base for a more intimate encounter with American history and even more cherry blossoms and other flowering trees lining the historic streets. 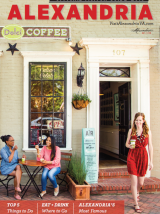 To learn more about Alexandria’s spring offerings, visit VisitAlexandriaVA.com/spring. Departing at 9:40 a.m., 1:05 p.m., 2:25 p.m., 3:45 p.m., 6:25 p.m., 7:35 p.m., and 9:05 p.m.
Cruise from Old Town Alexandria to Washington, D.C. to stroll among the famous cherry blossoms and take part in events of the National Cherry Blossom Festival including the Blossom Kite Festival. Potomac Riverboat Company offers a 25-minute direct water taxi from Old Town to the new Wharf development in D.C. From the dock at The Wharf, it’s a 10-minute walk to the cherry blossoms at the Tidal Basin. The water taxi docks at the Transit Pier, 950 Wharf St. SW, near the Tidal Basin, the National Mall, Hains Point and a Capital Bikeshare station. Cruise from Old Town Alexandria to Washington, D.C. to stroll among the famous cherry blossoms and take part in events of the National Cherry Blossom Festival including the Blossom Kite Festival. Potomac Riverboat Company offers a 30-minute direct water taxi between Old Town and the National Mall, disembarking just steps from the celebrated Yoshino cherry blossoms on the Tidal Basin. The water taxi docks at Ohio & West Basin Drive SW, near the Tidal Basin, Martin Luther King Jr. Memorial, Franklin Delano Roosevelt Memorial and a Capital Bikeshare station. Traverse the Potomac River from Old Town Alexandria and cruise past the cherry blossoms in Washington, D.C. on the Cherry Blossom Monuments Cruise by Potomac Riverboat Company. View and listen to the history of the iconic monuments, memorials and bridges as the D.C. region awakens to spring. See beautiful cherry blossom trees as you glide past Hains Point and head onward to Georgetown. The cruise is 45 minutes one-way and approximately 90 minutes round-trip and is offered during peak bloom on weekends from March 24 to April 15, 2018. In honor of the National Cherry Blossom Festival, Alexandria Restaurant Partners has partnered with the festival organization to offer delicious and unique cherry-themed dishes during the celebration from March 20 to April 15, 2018 at Virtue Feed & Grain, Vola’s Dockside Grill, The Majestic and Lena’s Wood-fired Pizza & Tap. Indulge in everything cherry, from a Chipotle-Cherry Margarita at Virtue Feed & Grain to a Pork Chop with Morrello Cherry Glaze at The Majestic to Cherry Clafoutis at Lena&apos;s. See Alexandria Restaurant Partners’ Facebook pages for the full cherry-licious menus at each location! Dolci Gelati will bring back its popular Cherry Blossom gelato for the National Cherry Blossom Festival this year, offering a light, floral flavor that’s perfect for springtime. Dolci founder Gianluigi Dellaccio knows a thing or two about concocting delectable gelato flavors. Dellaccio was appointed a Global Gelato Ambassador by the Italian Gelatoers Association in January 2018 and won "Best Gelato Flavor" at the Inaugural Gelato Festival America in November 2017. Popular Old Town eatery Magnolia’s on King will be serving up two cherry blossom specials, including a cherry blossom pork tenderloin with 24-hour brined pork tenderloin, sweet potato purée, crispy Brussels sprouts, Bing cherry compote, cherry & red wine reduction as well as a special cocktail. “I Cannot Tell a Rye” is a cherry sparkler with rye whiskey, allspice dram, Luxardo, brandied cherry juice, ginger syrup, topped with sparkling brut rose. Stop in during the Cherry Blossom Festival to try these seasonal specials. In celebration of the Cherry Blossom Festival, Sugar Shack Donuts will offer a White Chocolate Cherry Cheesecake Donut from March 20-April 15, 2018. The White Chocolate Cherry Cheesecake Donut has a white chocolate cherry cheesecake glaze and is rimmed with graham cracker crumbs. Sugar Shack also will offer Cherry Fritters for the month of April. Travelers hoping to take part in the region’s springtime festivities can take advantage of Kimpton Lorien Hotel & Spa’s “Awesome Blossom” package available March 20-April 15, 2018. Whether traveling with the family in tow or exploring the blooms with buds, guests will enjoy the “Awesome Blossom” package’s fun perks that allow them hit the ground running including two pre-loaded Metro cards, a $25 dining credit for cocktails, dining or room service, a map of the most popular spots, and a cherry blossom puzzle for the young (or just young at heart) to solve together as a memento of the trip. To celebrate Cherry Blossom season, The Alexandrian, Autograph Collection is offering the “In Bloom” hotel package, available April 1-30, 2018. Enjoy a picnic basket for two prepared by chefs at Jackson 20, two cherry blossom-themed welcome cocktails, and two pre-loaded Metro tickets, which will take you straight to the National Mall to see the cherry blossoms up close.